Our commitment is to bring about well-planned floral and sculptural beauty to the park, as well as increasing the safety of the grounds. While much has been done this last year, so much more is needed. Please visit the Volunteer and Donate pages to help support our projects. 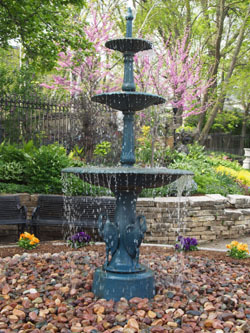 On August 18, 2016, a dedication ceremony was held celebrating the rebirth of this once inoperable fountain. 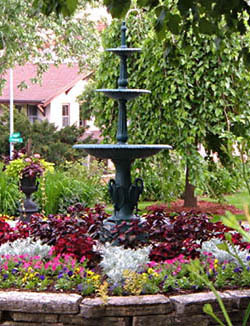 The circulating pump enabling the functioning of the fountain was made possible by a gift in honor of the late Keith Kreps. We are grateful to Keith's wife Wendy, who organized the event and presented the gift. Thanks to a Madison city improvement grant, we were able to install this custom identifying sign for the park. 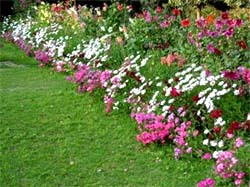 Annual flower planting, maintenance, preservation, and security are ongoing expenses. Your gifts and donations are much needed and appreciated! Your donations allowed us to build this custom cedar tool chest. 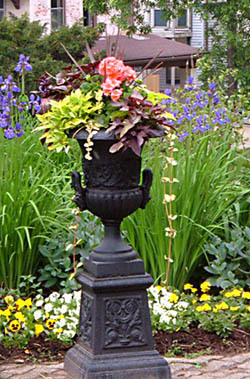 This marble urn was donated by Mansion Hill Inn. 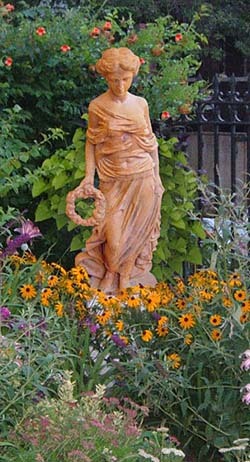 This chosen statue was installed in summer 2009. 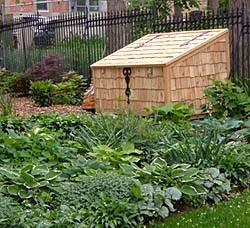 One of our three new planters installed in 2008. 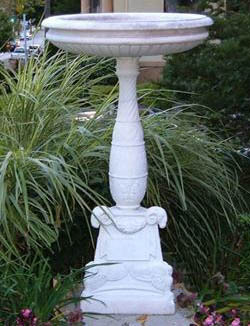 Our beautiful three-tiered fountain, installed in 2008. 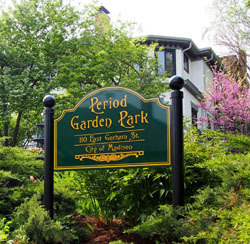 Monday - Sunday, 4:00 a.m. to 10:00 p.m.
Period Garden Park is an alcohol free park. Sorry, dogs are not allowed.